Economic independence and social integration are themes that rank highly among people with Cerebral Palsy as long-term objectives for rehabilitation. Young people with Cerebral Palsy who are currently enrolled in school rank getting a job as top priority and adults with Cerebral Palsy list work and independent economic life as two of the most important life domains related to health & well-being . Employment is very often the way in which individuals define themselves in society and are an important means of participating in society. As life expectancy and functional capacity of people with Cerebral Palsy increases, so does the need for inclusion into the workforce. Improved participation is often the philosophical long term goal of rehabilitation not only for people with Cerebral Palsy but also for many health professionals who work with them. To work towards this aim, it is therefore important for health professionals to be aware of the facilitators and barriers faced by people with Cerebral Palsy to participate actively in the workforce and to provide appropriate support to strive towards economic independence and social integration. The employment rate of adults with Cerebral Palsy is difficult to determine and depends highly on the context wherein an individual resides. Participation in competitive employment ranges from 21% to 56% and for sheltered or non-competitive employment it ranges from 5% to 18% . Table 1 presents the results from a population-based research in Denmark indicating an employment rate for the general population around 82% competitively employed whereas for Cerebral Palsy this averages to only 29%, with individuals with hemiplegia the highest enrolment in competitive employment (46%). It is important to recognize that only half of the persons with Cerebral Palsy who attended normal schooling managed to get a job which should be of specific concern . Educational achievement and cognition are seen to be the most significant factors that can influence employment outcome with the level of education, especially education beyond high school, being an important determinant of social participation and functioning  . Unfortunately, acquiring an education is often difficult for persons with Cerebral Palsy because of physical limitations as well as the possible presence of learning and communication problems. This is even more so in Low Income Countries where the inability to attend school can result in enormous socioeconomic consequences. Currently most efforts for rehabilitation often focus on the physical; however, the importance of cognition in later employability should be emphasized further. Furthermore, individuals with Cerebral Palsy often experience problems with social interaction with young people with Cerebral Palsy less socially active than young people without disability, and individuals with disabilities become increasingly socially isolated with age. The opposite applies to individuals without disability, who become more socially active after school age . The physical should however not be ignored as especially community mobility, higher level of self-care and more independence are all positively related with employment . 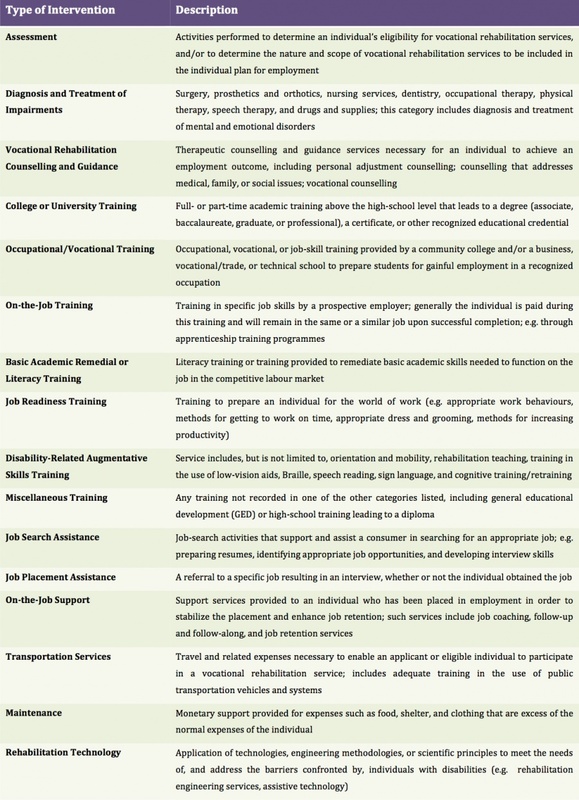 Home support programs, legal mandates, social attitudes, family support, environmental access and increasingly the access to computer technology and communication devices can significantly alter ones opportunities for employment  . Finally it should be noted that there might be work disincentives at play when governments provide disability benefits, this when advancement in work might cause financial loss through termination of these financial benefits. It is often seen that individuals receiving disability-related benefits are less likely to obtain employment, however this is probably related to functional severity and is thus not necessarily causal. Nevertheless, when implementing disability programs it should be done with caution not to exacerbate the possible adverse effects of financial benefits on employment . There is not a single sector where adults with Cerebral Palsy are generally employed, and this should definitely be dependent on the individual needs and possibilities. Nevertheless, a study in Denmark  found the five largest sectors where adults with Cerebral Palsy worked included Health and Social Services; Commerce; real estate, leasing and business services; Manufacturing; and Public Administration, Armed Forces and Social insurance. Employees work less than fulltime and the workplace pays attention to special needs. Employees receive a standard wage but the employer receives wage subsidies. Individuals with little ability to work can be given a wage and employer receives wage subsidies. The above highlights the importance of individually tailored solutions and to address work adjustment skills, independent living, workplace adjustments, employer education and advocacy. It however also indicates the importance of basic maintenance services (food, clothing, shelter, etc.) as a necessary precursor to enable an adult with Cerebral Palsy to gain meaningful employment. By addressing basic needs a better engagement in vocational rehabilitation programmes might be achieved. Despite a gradually increased policy of inclusive education and environmental access, adults with Cerebral Palsy remain under-represented on the labour market. Of particular concern are those with Cerebral Palsy who successfully completed normal schooling and were judged to have normal intellectual capacity yet by age 21-35 only half have gained employment . It seems that individualized and on-the-job support to people with Cerebral Palsy has the highest potential to achieve inclusion in the workforce. Nevertheless, basic needs have to be assured in order for the adult with Cerebral Palsy to engage in vocational programmes. In order to improve the inclusion of people with Cerebral Palsy into society and the general workforce, rehabilitation workers should pay more attention to self-care skills, community mobility and independence training. In addition, removing environmental constraints and provision of appropriate rehabilitation technology can also enhance social integration and participation in the regular workforce. ↑ 1.0 1.1 1.2 1.3 Huang, I., Holzbauer, J. J., Lee, E. J., Chronister, J., Chan, F.,and O'Neil, J. (2013). Vocational Rehabilitation Services and Employment Outcomes for Adults with Cerebral Palsy in the United States. Developmental Medicine and Child Neurology, 55(11), 1000-1008. ↑ 2.0 2.1 2.2 2.3 2.4 2.5 Michelsen, S. I., Uldall, P., Kejs, A. M. T., and Madsen, M. (2005). Education and Employment Prospects in Cerebral Palsy. Developmental Medicine and Child Neurology, 47(8), 511-517. ↑ 3.0 3.1 3.2 Huang, I. C., Wang, Y. T., and Chan, F. (2013). Employment Outcomes of Adults with Cerebral Palsy in Taiwan. Disability and Rehabilitation, 35(3), 228-235. ↑ 4.0 4.1 Murphy, K. P., Molnar, G. E., and Lankasky, K. (2000). Employment and Social Issues in Adults with Cerebral Palsy. Archives of Physical Medicine and Rehabilitation, 81(6), 807-811.